DOVER – To achieve public compliance with laws and regulations through education and enforcement actions that help conserve Delaware’s fish and wildlife resources and ensure safe boating and public safety, DNREC Fish & Wildlife Natural Resources Police officers between April 2-8 made 1,398 contacts with hunters, anglers, boaters and the general public, issuing 13 citations. Officers responded to 32 complaints regarding possible violations of laws and regulations or requests to assist the public. An increased Fish & Wildlife Natural Resources Police presence continued at the C&D Canal Conservation Area and Michael N. Castle Trail. Fish & Wildlife Natural Resources Police officers, along with other division staff, will be attending the Ducks Unlimited Greenwing Conservation Festival on April 14 at Fish & Wildlife’s Owens Station complex near Greenwood, where we will be providing kids casting activities, hunter education, patrol vessel, Operation Game Theft trailer and waterfowl and trout stamp displays, as well as K9 and waterfowl banding demonstrations. On April 7, Fish & Wildlife Natural Resources Police officers presented information on hunting, fishing and boating and displayed the Operation Game Theft Trailer at LureFest in Bowers Beach. On April 8, Fish & Wildlife Natural Resources Police arrested Zachary L. Jackson, 22, of Milton, for one count each of failure to check antlered deer within 24 hours and removing antlered deer parts prior to checking near Milton. Jackson was arraigned at Sussex County Justice of the Peace Court 3 where he was released on a $500 unsecured bond pending a future court date. Wildlife Conservation: Failure to check antlered deer within 24 hours (1), and removing antlered deer parts prior to checking (1). Fisheries Conservation: Unlicensed fishing (3), use of illegal non-circle hook during striped bass spawning season (1), illegal method of take (1), and no trout stamp (1). Public Safety: Following too closely in a motor vehicle (1). 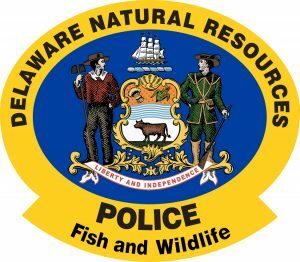 Delaware Fish & Wildlife Natural Resources Police want to remind turkey hunters while in pursuit of wild turkeys, it is unlawful to use bait as an attractant. Some common bait that is illegally used includes wheat, corn, sunflower seeds and various birdseed blends. Hunters are responsible for ensuring that no bait is present in an area where they are hunting turkeys. Delaware offers hunting opportunities for wild turkeys on several state wildlife areas and state forests by permit only. Turkey hunters are drawn via the lottery and issued a permit that enables them to hunt a specified public land area during a specified one-week segment. Hunters selected for a public land permit must carry their permit, as well as their turkey education card and hunting license at all times while hunting. 2018 turkey check station hours may vary, so hunters are advised to call the station where they are likely to check a bird to confirm the hours of operation. Hunters who want to have their bird scored and entered into the National Wild Turkey Federation records also are reminded to have their bird’s live weight recorded on a certified scale. If the check station does not have a certified scale, hunters will be directed to another station to have the turkey re-weighed. To purchase a Delaware hunting license, licenses are sold online, at the licensing desk in DNREC’s Richardson & Robbins Building, 89 Kings Highway, Dover, and by license agents statewide. To find a participating agent, or to purchase a license online, visit Delaware Licenses. For additional information on Delaware hunting licenses, call 302-739-9918.